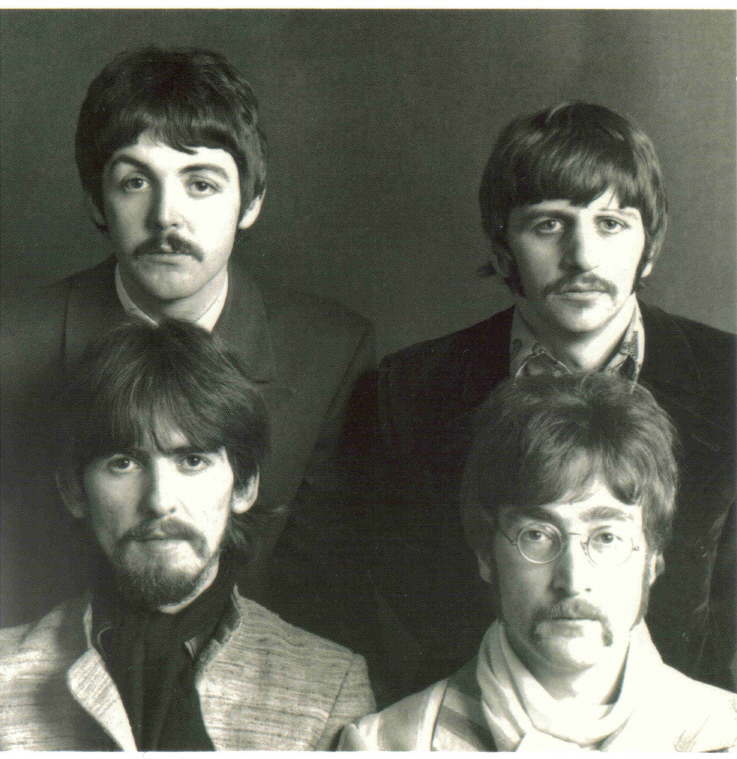 The Beatles Collection » 06. 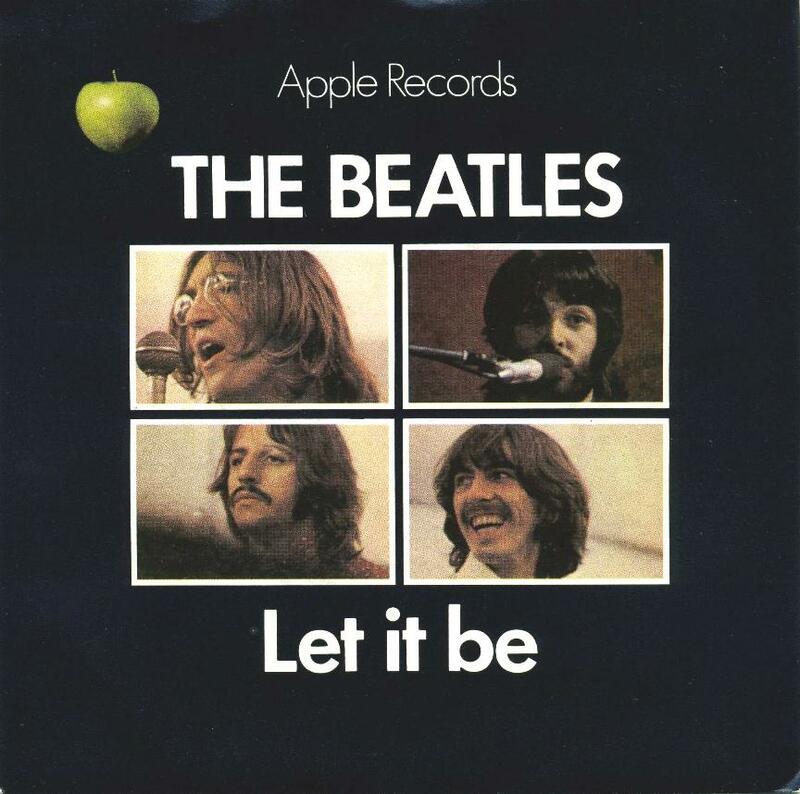 Beatles on Apple Records. Part 2 – Singles. 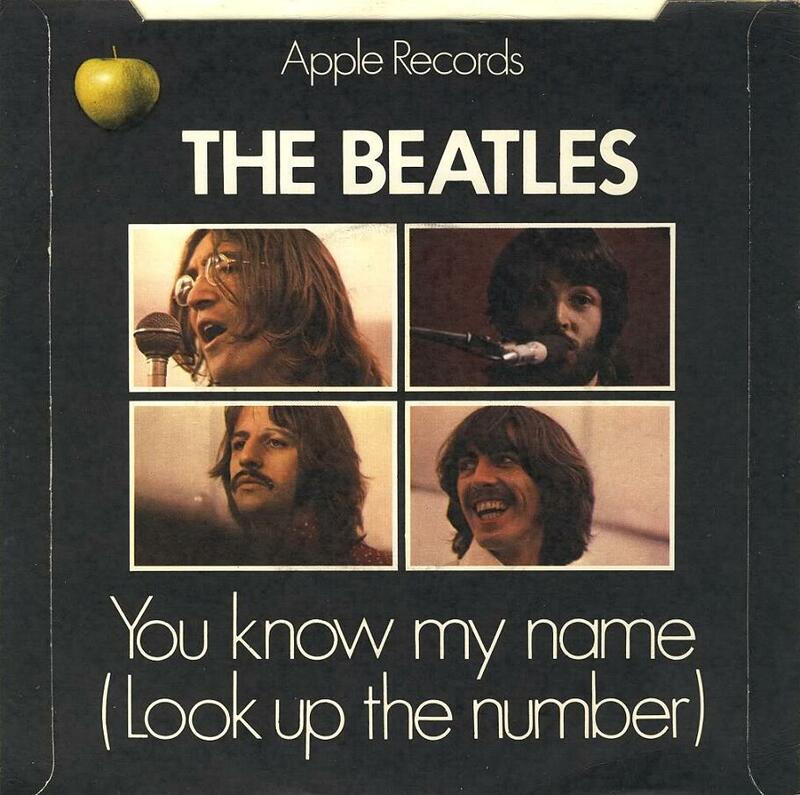 Let It Be / You Know My Name (Look Up The Number), Apple R 5833. 1. 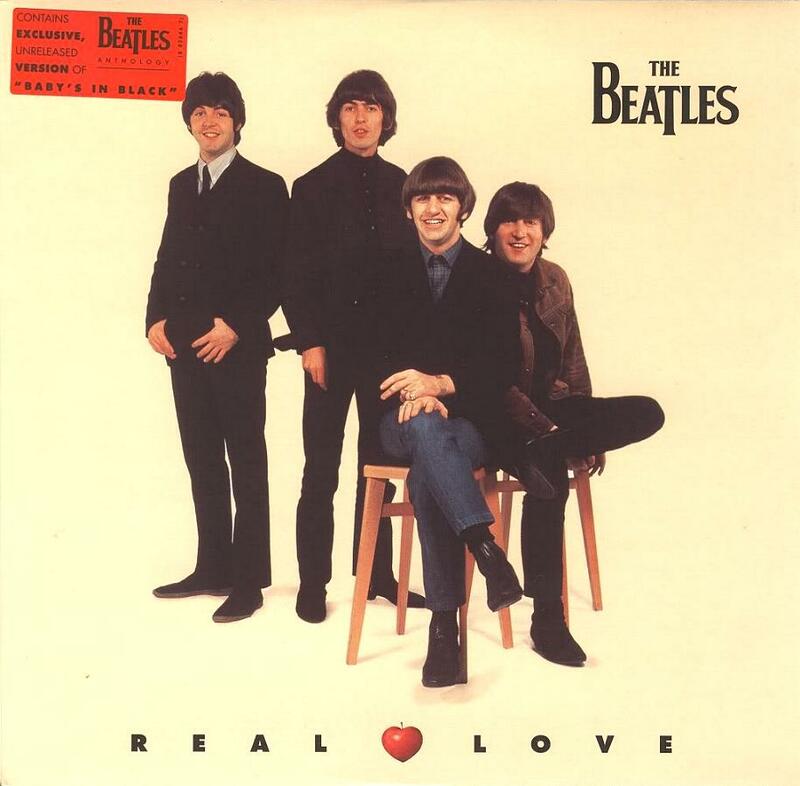 First pressing, March 6, 1970. First records were housed in original picture sleeve with rounded flaps. 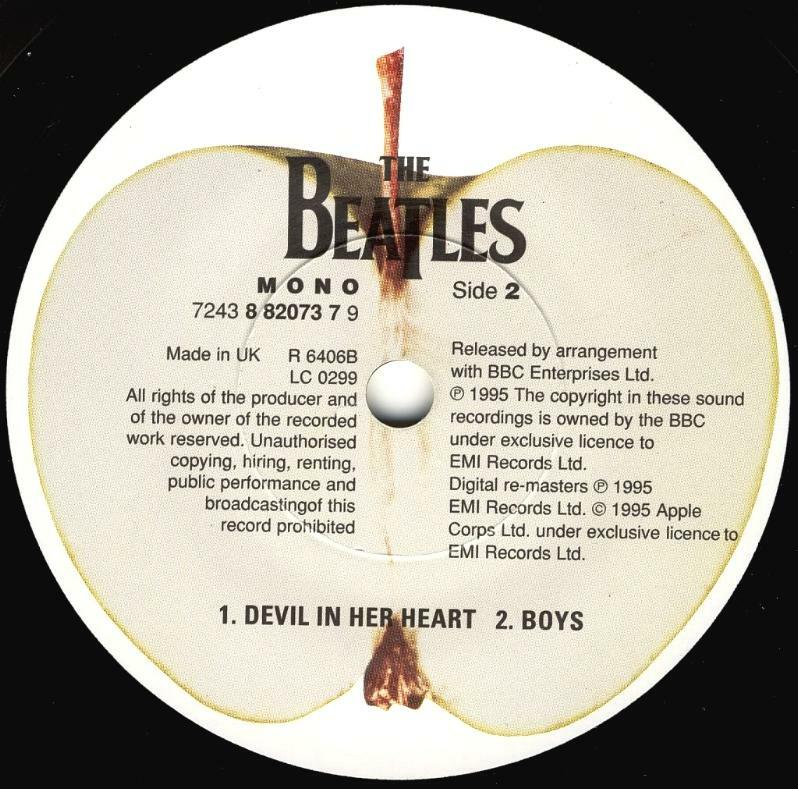 Dark green label with an image of an apple on side 1 and sliced apple on side 2. Publishing year printed with small copyright symbol (p). The labels are quite dark although the actual shade of green varies greatly among copies. With or without KT tax code. Push-out or solid center. 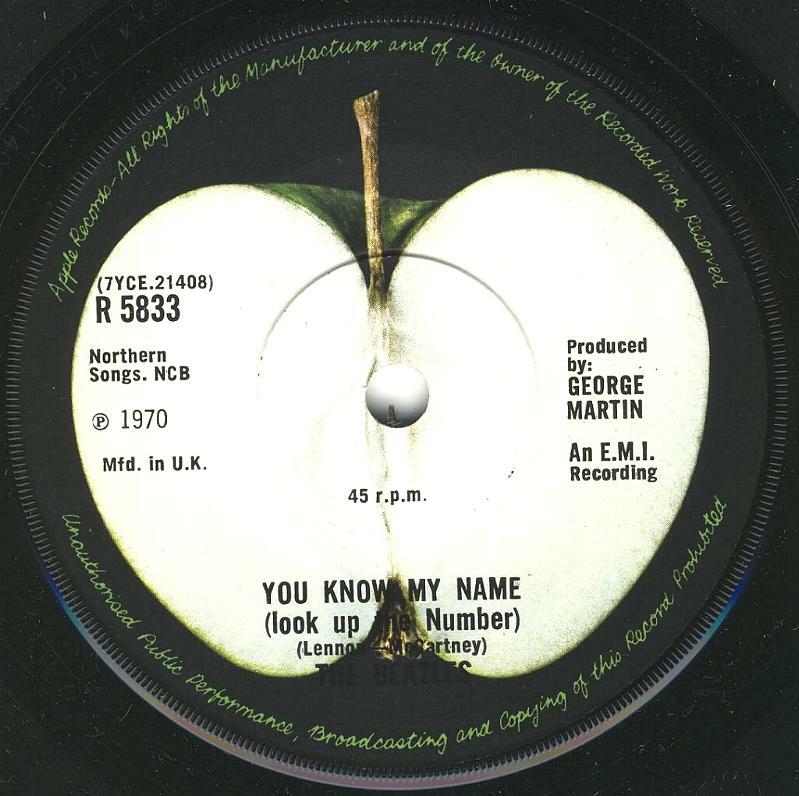 First pressing has a scratched out APPLES 1002 matrix number to run off groove on B-side. Matrix numbers: Side A: 7YCE.21407-1U, Side B: APPLES 1002 7YCE.21408-1U. 2. 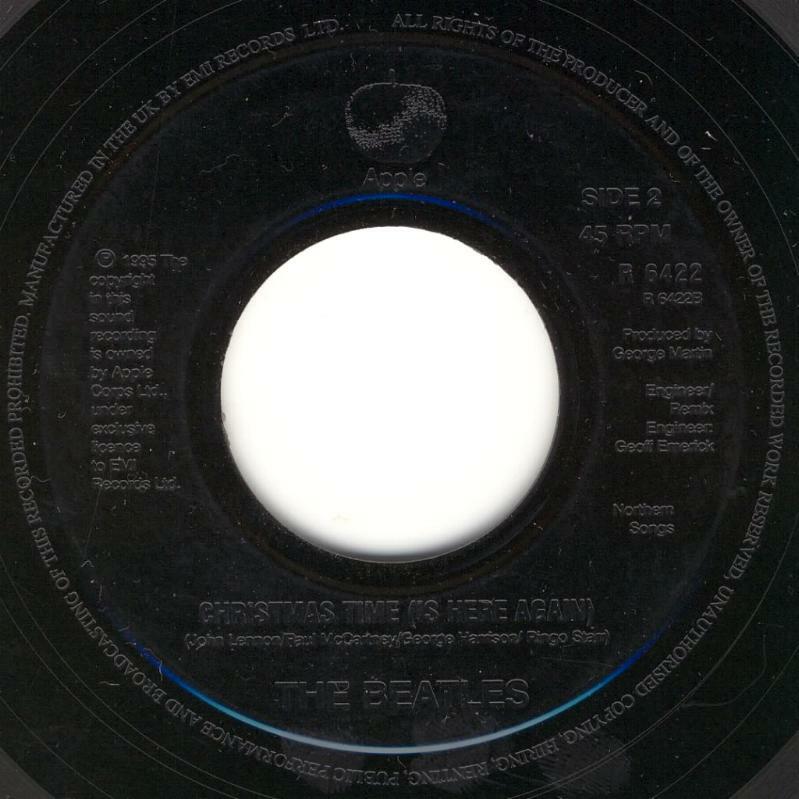 Second pressing, spring 1970. 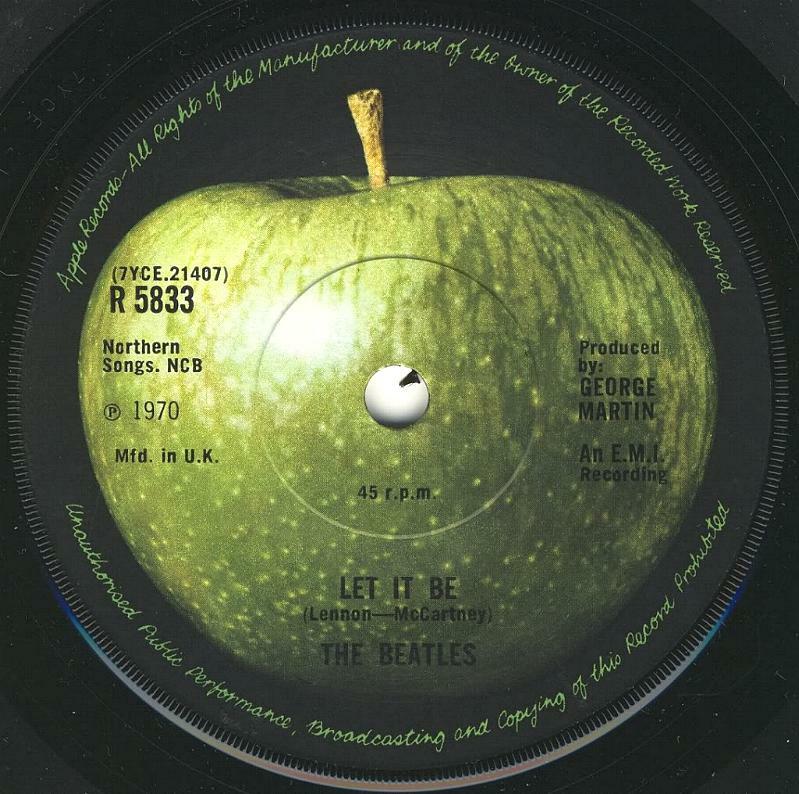 Same dark green label with an image of an apple on side 1 and sliced apple on side 2. Publishing year printed with small copyright symbol (p). With or without KT tax code. Push-out or solid center. 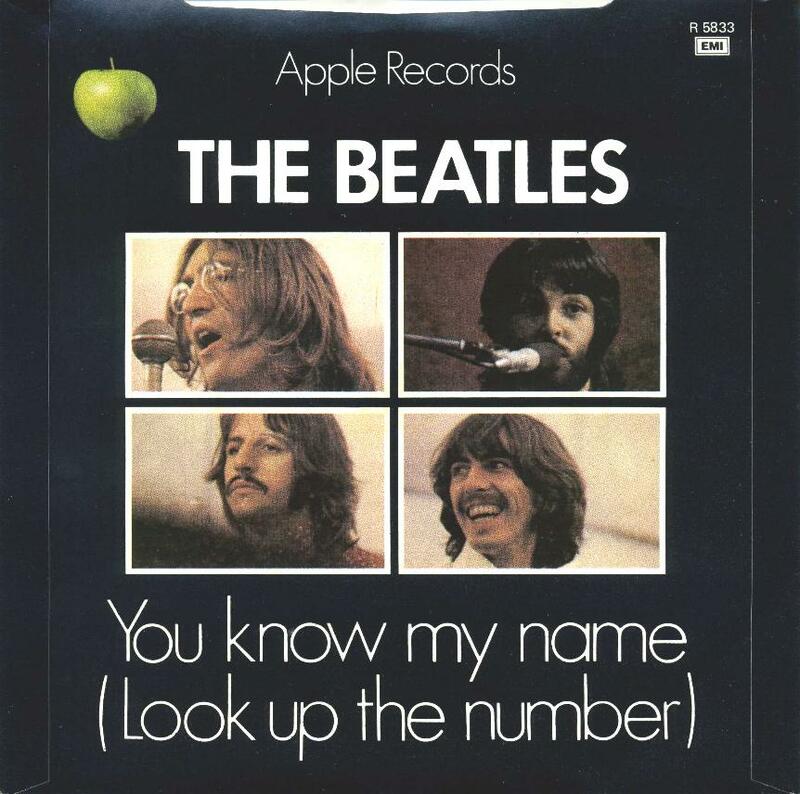 Same matrix numbers: Side A: 7YCE.21407-1U, Side B: APPLES 1002 7YCE.21408-1U. But the records were housed in standard glossy black die-cut sleeves. 3. 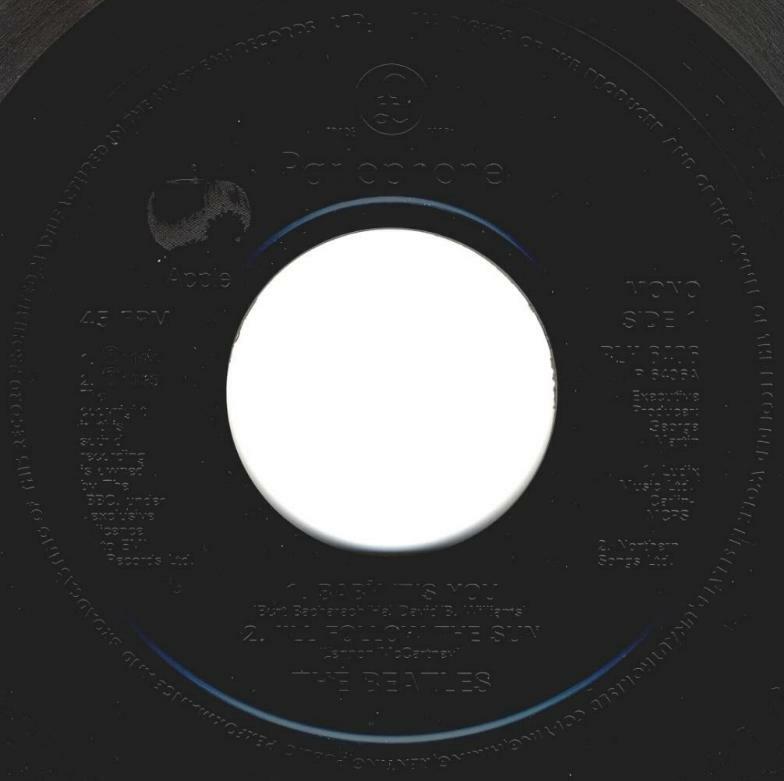 Third pressing, summer 1970 – September 1970. 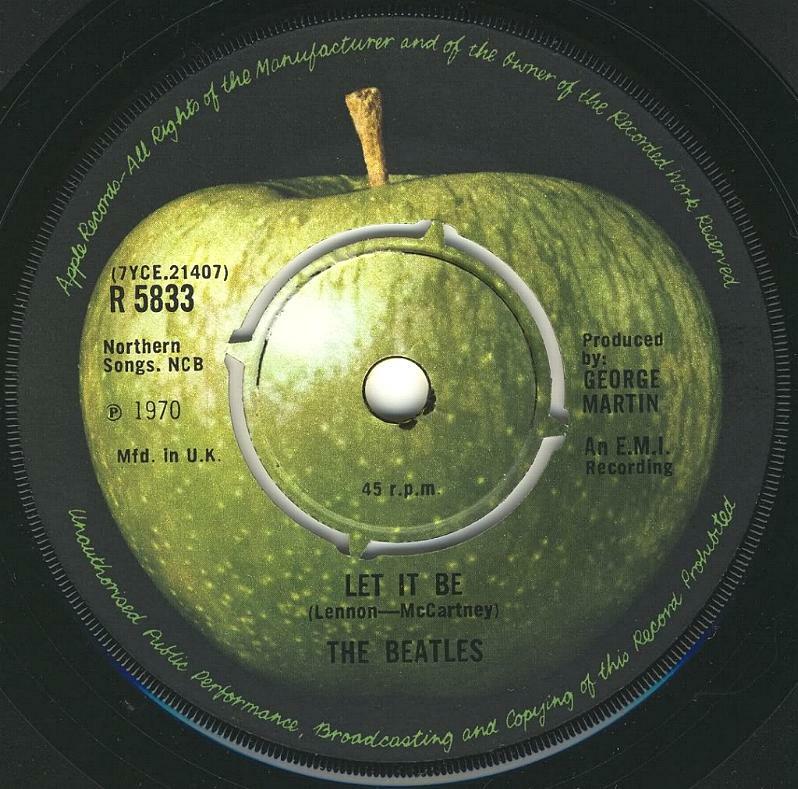 Same dark green label with an image of an apple on side 1 and sliced apple on side 2. Publishing year printed with small copyright symbol (p). Without tax code. Push-out or solid center. Matrix numbers: Side A: 7YCE.21407-1U, Side B: 7YCE.21408-1U. 4. Fourth pressing, March 6, 1976. 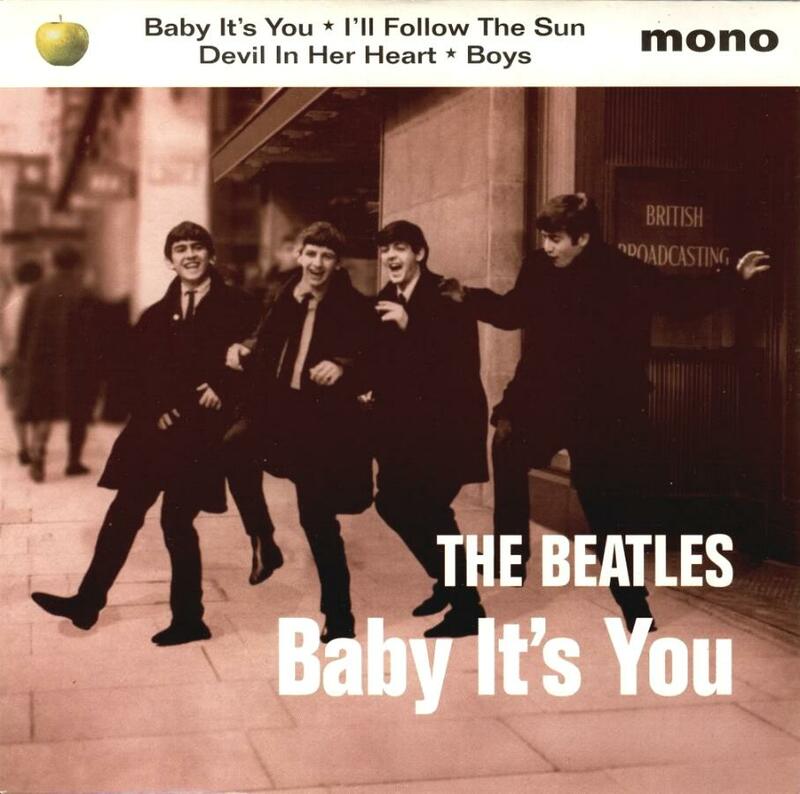 From “The Beatles Collection 1962-1970″ box set (BS-24). 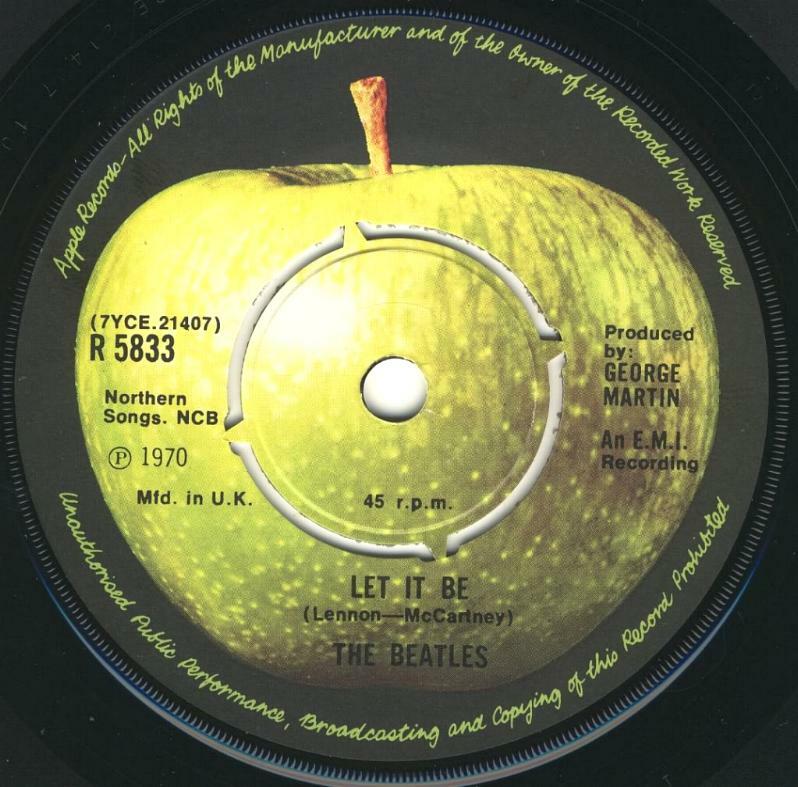 These pressings have original top-opening sleeve with green front and pictures back. 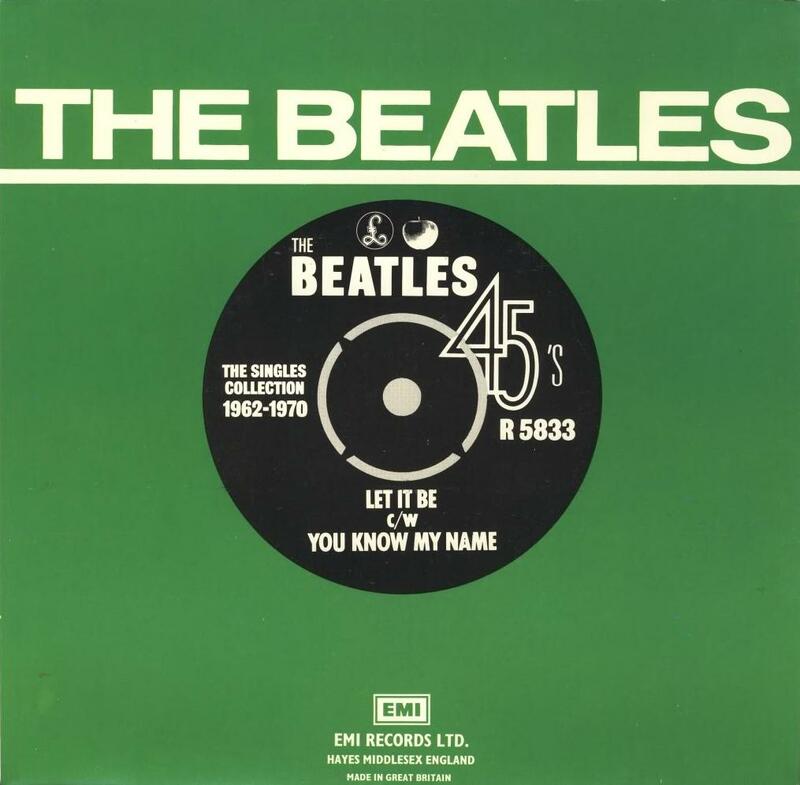 Light green label with publishing year printed with big copyright symbol (P). Matrix numbers: Side A: 7YCE.21407-1U, Side B: 7YCE.21408-1U. 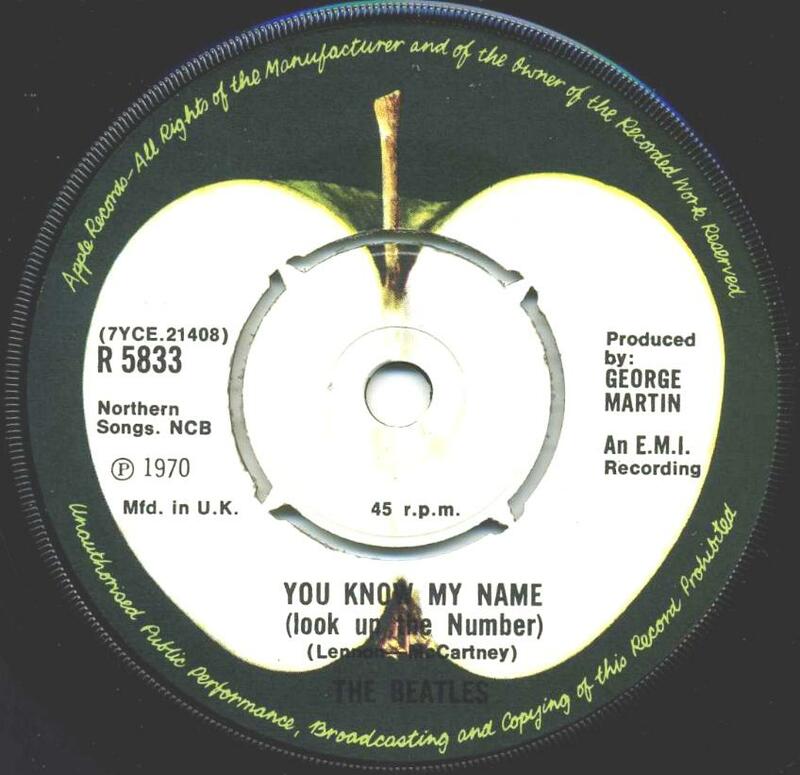 Light green-yellow label with publishing year printed with big copyright symbol (P). Matrix numbers: Side A: 7YCE.21407-1U, Side B: 7YCE.21408-2. 6. 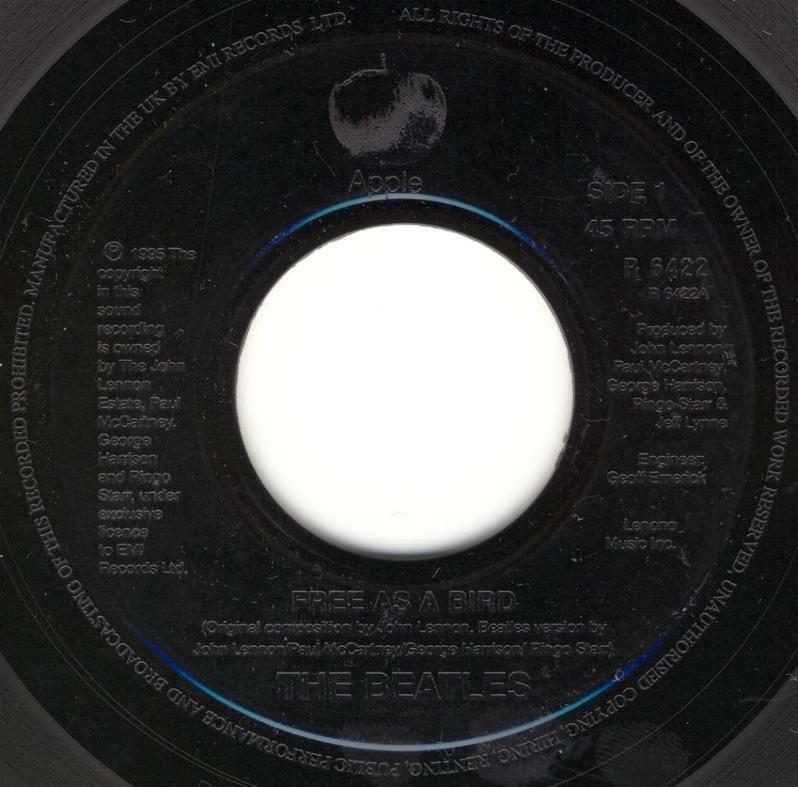 Sixth pressing, beginning of the 90s. The final pressing has silver label with black textur print and logo. Rimtext embossed on the trail off area. The rimtext wording is: “UNAUTHORISED COPYING, HIRING, RENTING, PUBLIC PERFORMANCE AND BROADCASTING…”. Baby It’s You, Apple R 6406. 1. First pressing, March 20, 1995. 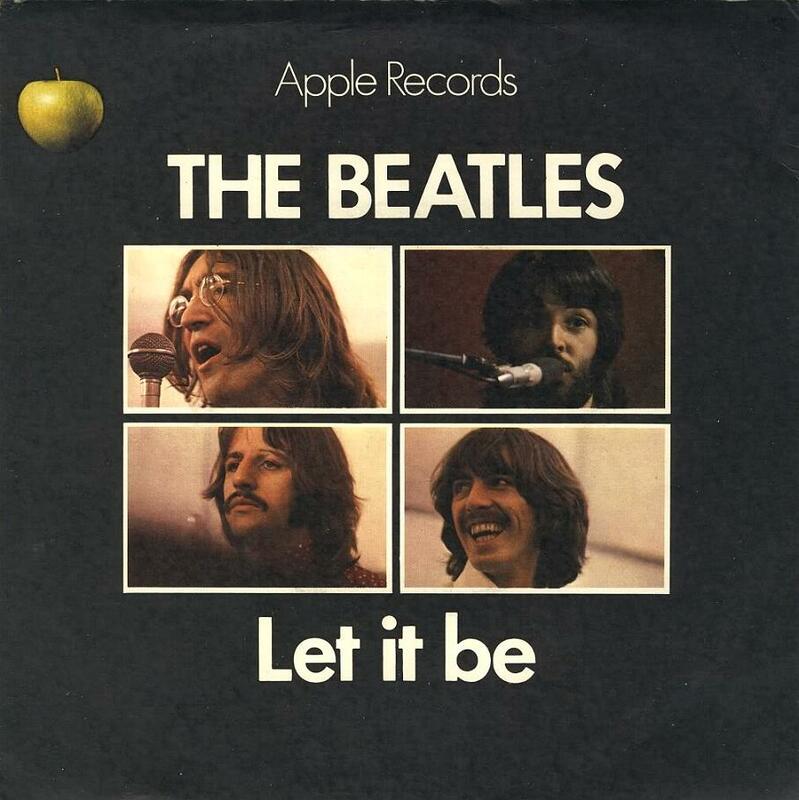 This is first Beatles EP on Apple Records. 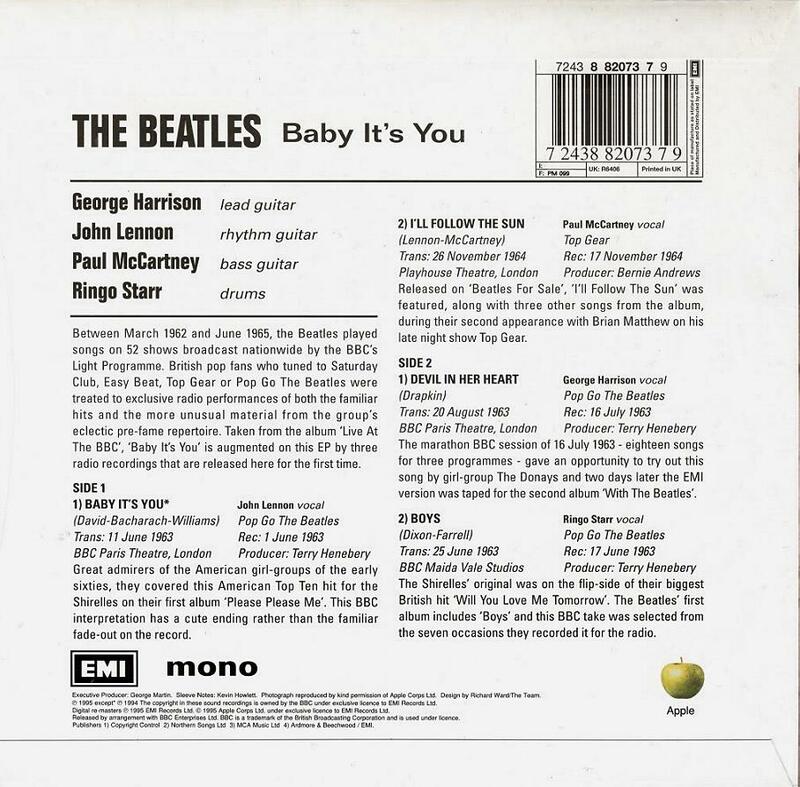 The original EP sleeves have diagonal-cut upper and lower rear flaps and bar-code on the back side. 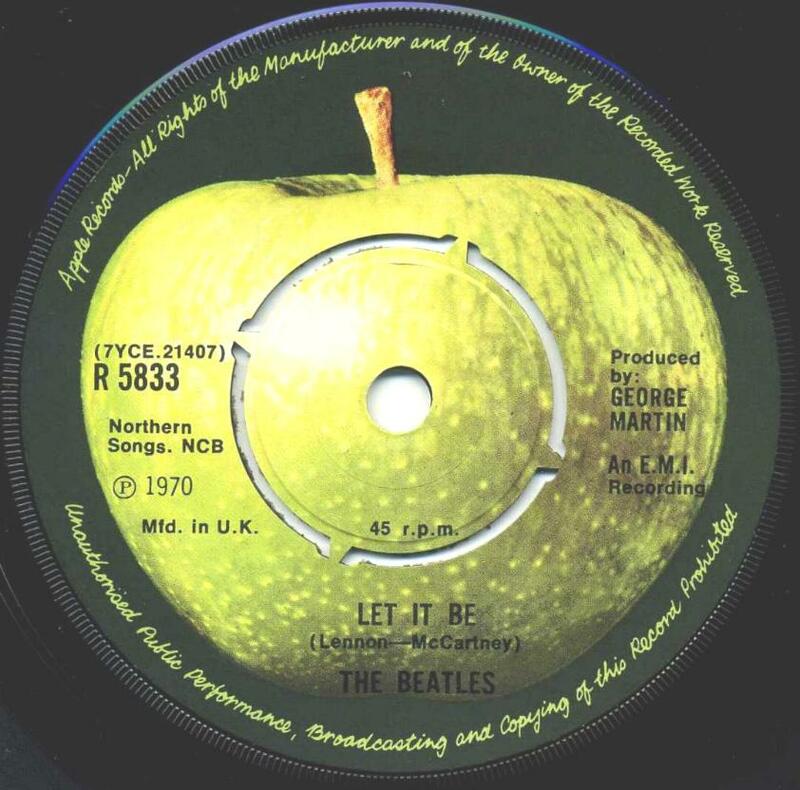 The first pressing has light green label with an image of an apple on side 1 and sliced apple on side 2 and on white background. 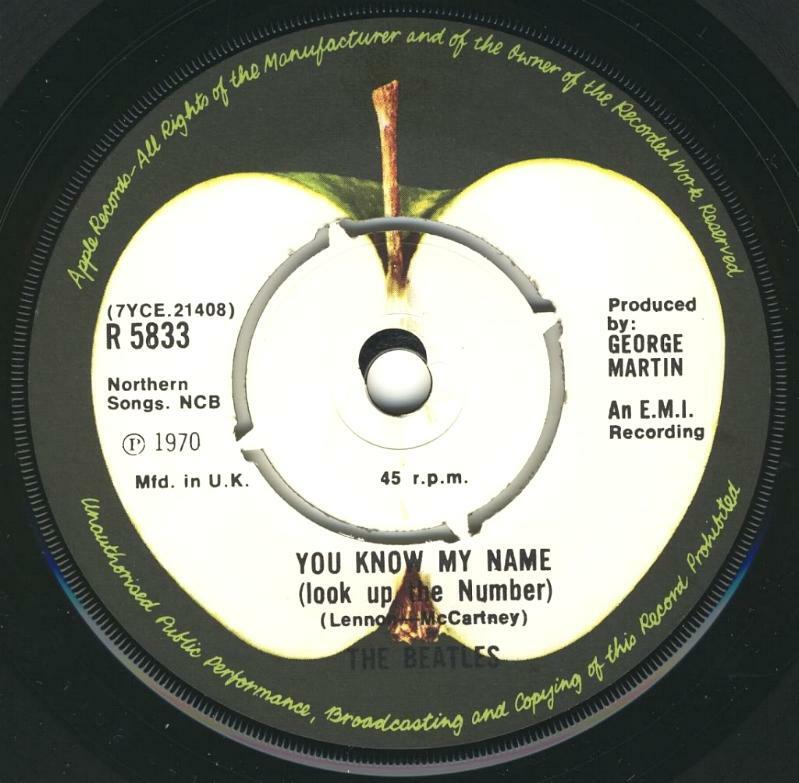 Matrix numbers: Side 1: 8820737 A-1-1 D; Side 2: 8820737 BA-1-1 D.
Promotional copy for jukebox has catalog number RLH 6406 and black glossy label with embossed text and Apple and Parlophone logos. Rimtext the wording is: “UNAUTHORISED COPYING, HIRING, RENTING, PUBLIC PERFORMANCE AND BROADCASTING…”. 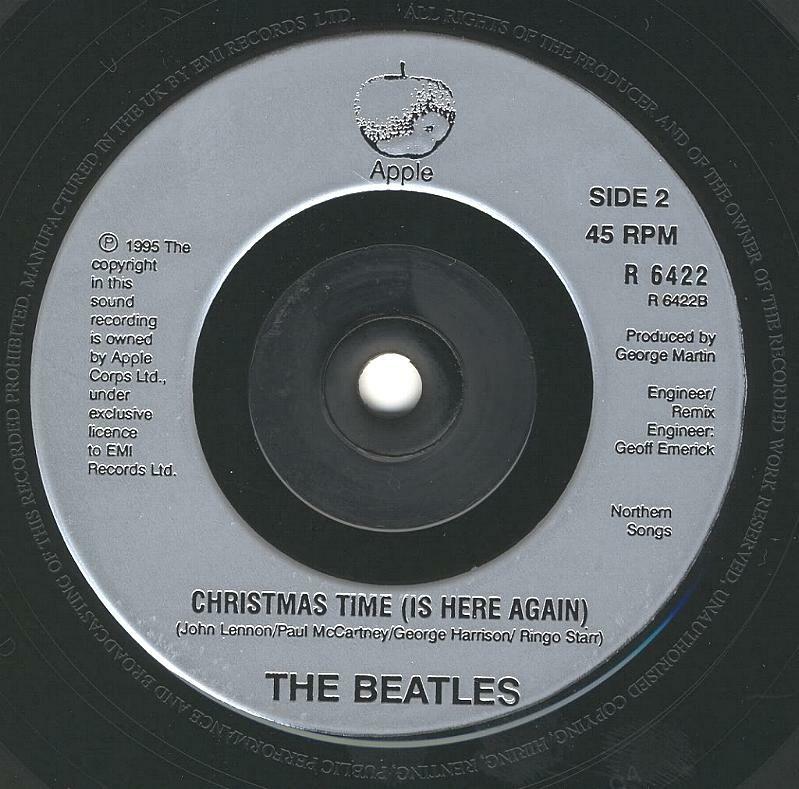 Matrix numbers: Side 1: RLH 6406 A-1-1-01 8820737 A-02-1-Y D; Side 2: RLH 6406 B-2-1-01 8820737 B-02-J D.
Free As A Bird / Christmas Time (Is Here Again), Apple R 6422. 1. First pressing, December 4, 1995. 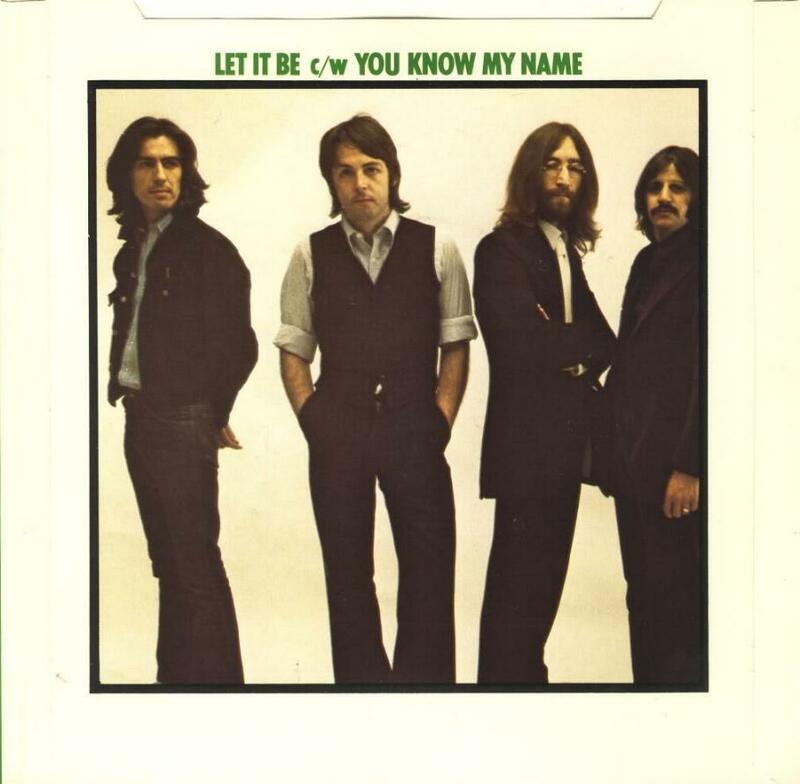 This is first Beatles single with new song after 25 years. 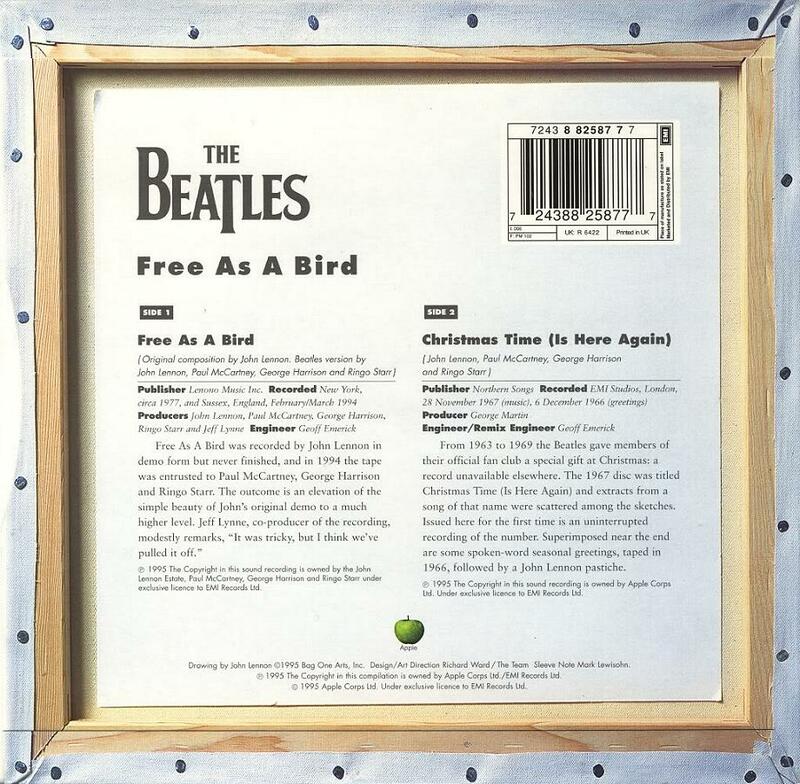 Free As A Bird was recorded by John Lennon in demo form but never finished, and in 1994 the type was entrusted to Paul McCartney, George Harrison and Ringo Starr. 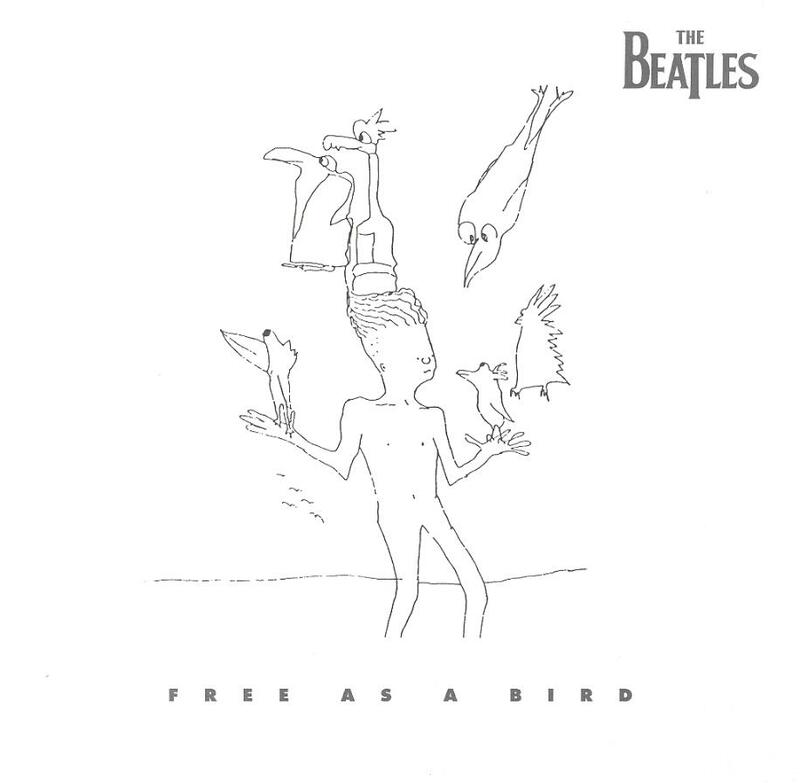 The outcome is an elevation of the simple beauty of John’s original demo to much higher level. 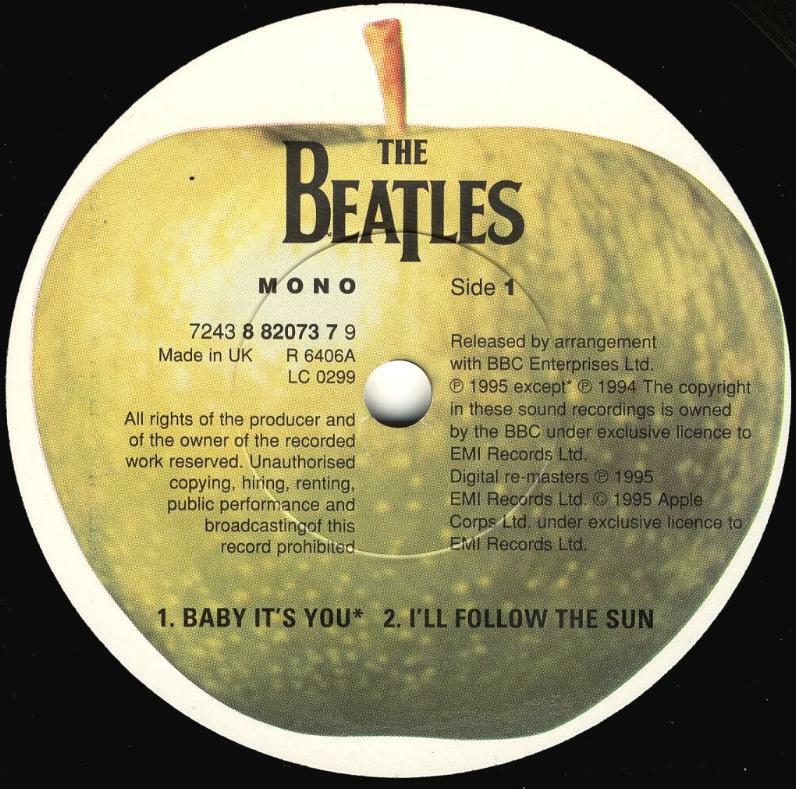 The original EP sleeves have diagonal-cut upper and lower rear flaps and bar-code on the back side. 1. First pressing, December 4, 1995. 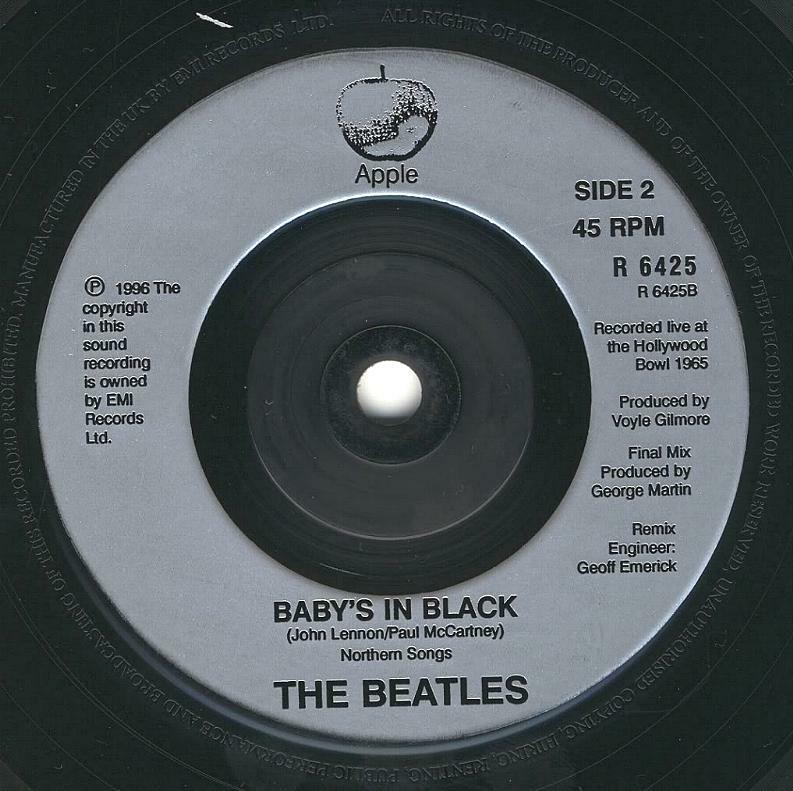 Original pressing has silver label with black textur print and logo. Rimtext embossed on the trail off area. The wording is: “UNAUTHORISED COPYING, HIRING, RENTING, PUBLIC PERFORMANCE AND BROADCASTING…”. 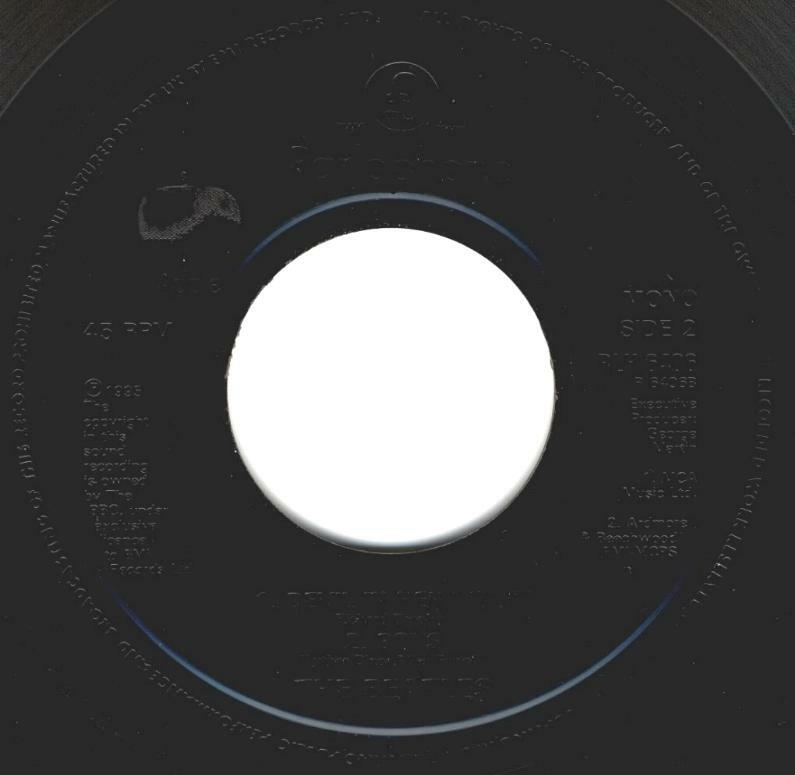 Matrix numbers: Side 1: R6422 A-2-1-Q4 D; Side 2: R6422 B-21-Q4 D.
Promotional copy for jukebox has black glossy label with embossed text and Apple and Parlophone logos. Rimtext the wording is: “UNAUTHORISED COPYING, HIRING, RENTING, PUBLIC PERFORMANCE AND BROADCASTING…”. 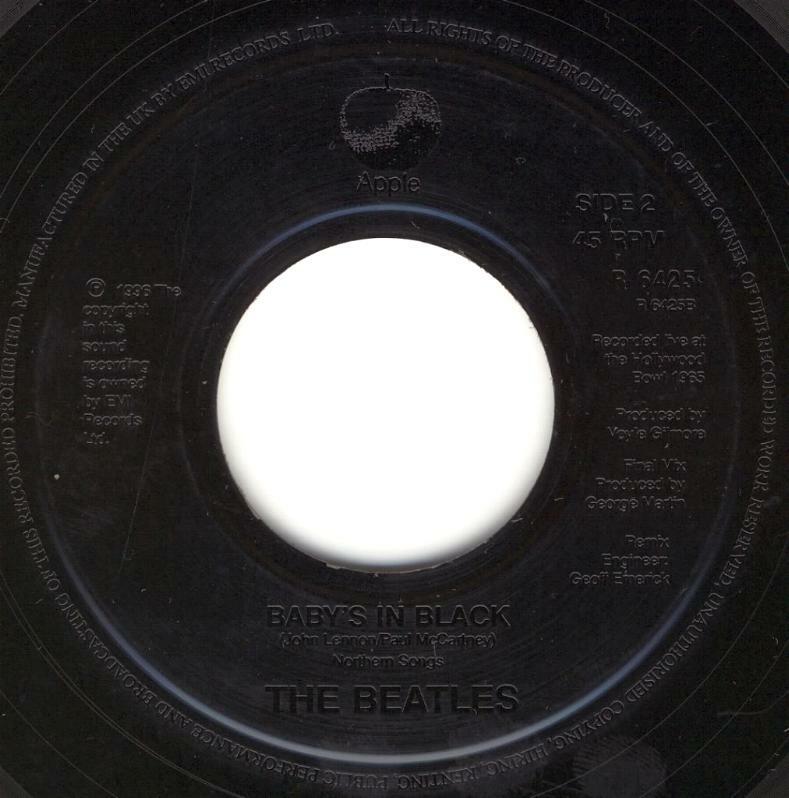 Matrix numbers: Side 1: R6422 A-2-1-Q4 D; Side 2: R6422 B-21-Q4 D.
Real Love / Baby’s In Black, Apple R 6425. 1. First pressing, March 4, 1996. 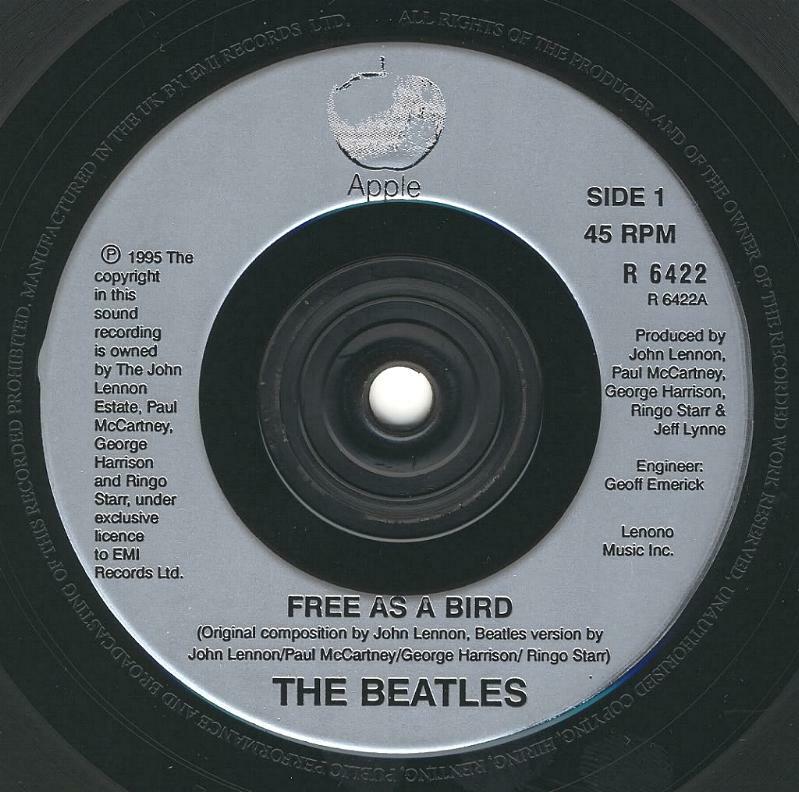 A year after realising Free As A Bird, Paul McCartney, George Harrison and Ringo Starr completed a second unfinished John Lennon recording, adding new vocal and instrumental tracks to strengthen and enrich the original sound from John’s cassette. Real Love and care was invested and fine is the result. 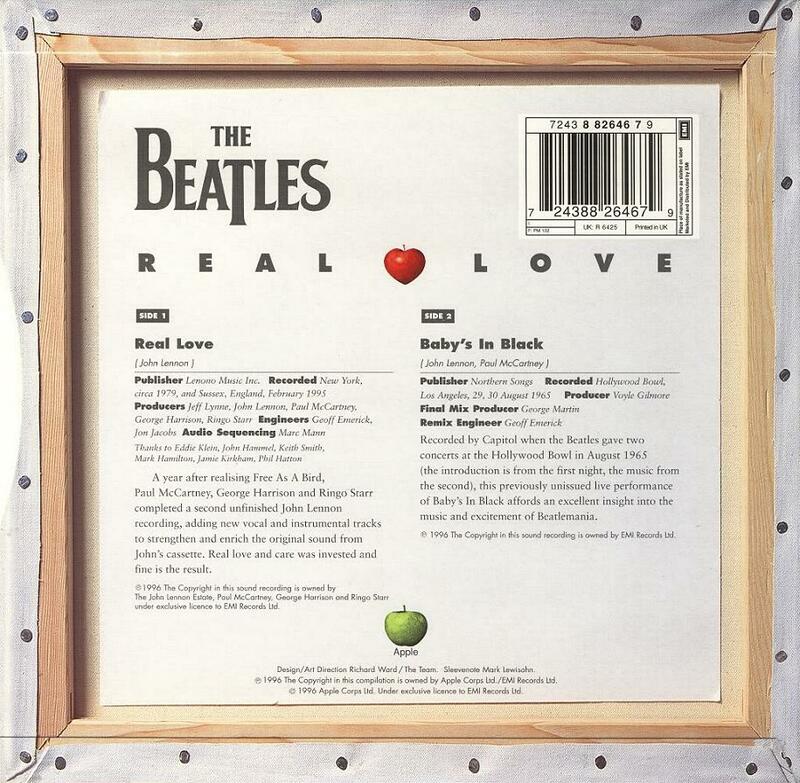 The original EP sleeves have diagonal-cut upper and lower rear flaps and bar-code on the back side. Some copies have red sticker on the front. 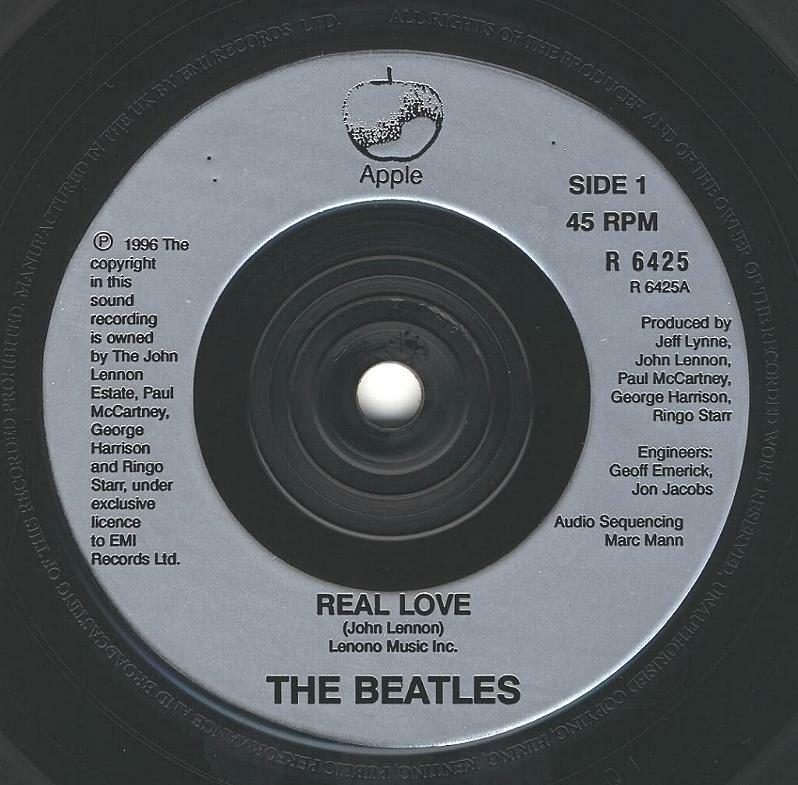 Original pressing has silver label with black textur print and logo. Rimtext embossed on the trail off area. The wording is: “UNAUTHORISED COPYING, HIRING, RENTING, PUBLIC PERFORMANCE AND BROADCASTING…”. 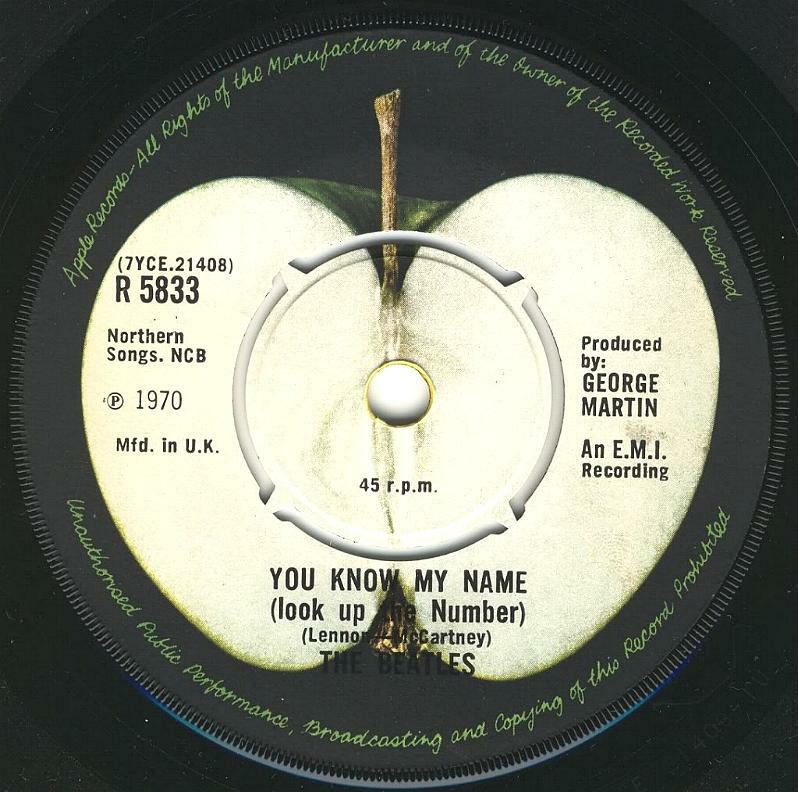 Matrix numbers: Side 1: R6425 A-1-1-Q1 D; Side 2: R6425 B-1-1-Q1 D.
Promotional copy for jukebox has black glossy label with embossed text and Apple and Parlophone logos. Rimtext the wording is: “UNAUTHORISED COPYING, HIRING, RENTING, PUBLIC PERFORMANCE AND BROADCASTING…”. Matrix numbers: Side 1: R6425 A-1-1-Q1 D; Side 2: R6425 B-1-1-Q1 D.